For years I’ve been bugging people for money, love, answers, replies and reviews via email. Sometimes I get what I want. Sometimes I don’t. Here are my under-researched, unacademic and totally unfounded findings in the art of email persuasion. Keep the email as short as possible. Say what you want to say with as few words as possible. Respect the recipient’s time – they’re as busy as you are. They don’t want to read unnecessary information. Cut out at least 30% of the words on the first edit (and you should be editing at least three times). That’s it! No logos, no graphics, no borders, no images and, definitely, no animated GIFs. 9 times out of 10 you will be trying to get your recipients to first click on a link in the email (and then to buy, sign up or perform some action). To increase the likelihood of the initial click happening, make sure you’re only trying to get them to go to one place. Only try to get them to do one thing. Don’t present the readers with a hotch-potch of links, stories and messages. You are saying: “you will find some of these less interesting than others” and the recipients will automatically think that the link you really want them to click is the least interesting one. You may have several links but they should all go to the same place. There may be one exception to the above rule. In the PS. Every email should have a PS. Because everyone reads the PS. So, if you really want to put an extra link in an email, you should add it to the post script. Otherwise, use the PS to reinforce the main message or link of the email. Contrary to what some people may tell you, use of the word “free” in the subject line of a bulk email does not harm deliverability. People love FREE! My open rates and click throughs go through the roof when I mention that magic word. If you make a “one time offer”, make sure you only make it once and don’t offer it cheaper later in the day. Brand building, establishing authority and personal photos are all great things – but usually, not in a sales email. Every sentence of an email should be about how the recipients life can and will be made better. Always imagine your email’s recipients are thinking: What’s In It For Me? 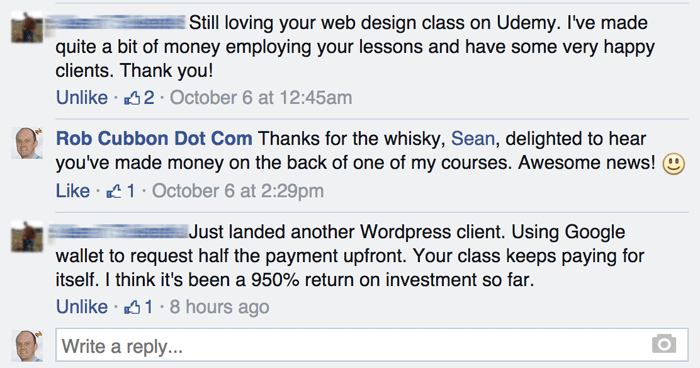 I saw a huge take up on an offer I made recently when I dropped in this image of a testimonial I had for this course on Facebook. People are only interested in how you can help them. They are very interested in how you can help them make more money. You can write compelling and persuasive emails. Keep it simple (and plain) and focus on the benefits to the recipient. I’m totally guilty of including multiple links … But do like to include a P.S. every time I can! Well, Nick, this was a tongue-in-cheek “what’s worked for me” sort of post, but I’ve found the single link works better than multiple different stories. It’s quicker to do as well! But hey, what about the plain email. I’m guessing it’s so the email appears more personal, but I not totally sure about no graphics. You use one in point 7. Plus 1000 for plain text email. I tend to triage most email on my phone, and if I have to fiddle around enlarging the font etc, I’m gone! I must admit I don’t do PS, and I definitely fell for the line on avoiding FREE in the subject to have better deliverability. You delivered the goods once again Rob. Thank you. Wow, good point Naima – thanks. Okay, there is not one size fits all.. LOL!!! I chat a LOT in my emails my but subscribers love it. It’s how they get to know me. I do have my header as the graphic in the email so they KNOW it’s from me. Other than that I don’t include anything else. I’m always good with only giving them one choice, got that one down. I guess I’m the only person who never reads the P.S.! Someone has to be different right! So I’ve admitted numerous times that I don’t follow what everyone else teaches, I’ve found my own way and so far it works great for me. Let’s just hope it stays that way! Thanks my friend and congratulations on the book release! Awesome. Yes, Adrienne, this was a sort of tongue-in-cheek “what works for me” post not a definitive ” you’ve got to do this”. I just wrote the headline as click-bait – sorry! Anyway, I know you write emails about lots of stuff with lots of different links and this “newsletter” model works really well for building rapport and authority. However, when it comes to persuasion, or at least, a sales email, I really think sticking to the short, to-the-point email will stand you in good stead. Also, I put my logo and my signature images in my emails (and sometimes one other image as well, as discussed above) so I don’t even follow my own advice. But I think really full-on HTML emails with borders, images, and clever stuff are just not worth the bother. I think what we do is the happy medium between branding and the personal touch. Best of luck with your product release, Adrienne. I’m in the process of changing up my email strategy at the moment. So your tips have really helped. Glad it helped you, Naomi. Thank you so much, John. Glad I’ve made it into your Evernote.